This application copies the file of the built-in storage to microSD. A re-store check button starts a re-store at the time of ON. ② It changes it to a re-store mode. ③ It opens up a setting window. 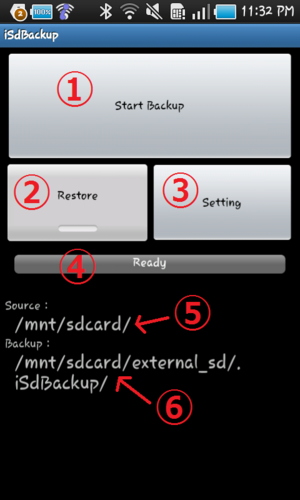 You can change setting of the setting of the file not to copy and the automatic backup. ⑤ It displays the pass of the built-in storage of the origin of backup. ⑥ It displays a pass of microSD of the backup. It is a phone of non-correspondence when it is displayed here with "Not found".